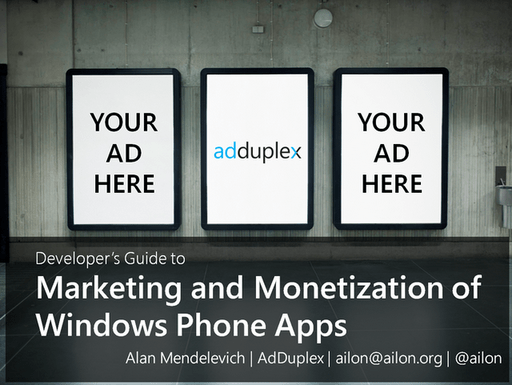 On the last day of January I’ve been honored to present my talk on Windows Phone app marketing and monetization at the meeting of Windows Phone user group in London. Thank you, Matt Lacey, for the invitation! I’ve presented a similar talk several times in Lithuania and Latvia already, but people in the audience were mostly “aspiring” Windows Phone developers at best. This time the room was full of real WPdevs who could teach me a lot and I was supposed to deliver something worthwhile for the group. I hope I did OK and Matt is not sorry he gave me the opportunity 😉 I also hope my thick Eastern European accent and crappy grammar weren’t a big problem. If you want me to present on the subject at your conference, user group or other event, please, don’t hesitate to email me.